Oh Hell is an addictive and fun card game with a difference and you will soon realise why it is called Oh Hell. You play against Bumble, Cynthia and Hattie and must get the exact number of tricks you bid for each hand - or else. 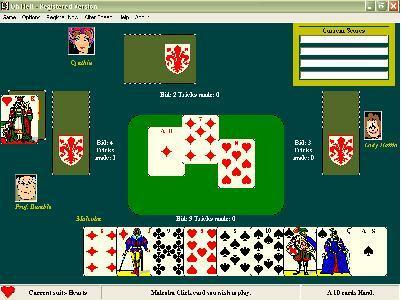 Ten cards are dealt to each player and each player then bids on how many tricks he/she can make. The next hand is nine cards and then down to one card and back up to ten cards. Ideal for your Net Book. This game is a fun way to test your memory skills. Game collection with 10 free casino & cards games. A collection of three great games for babies, toddlers and pre-schoolers. Qweas is providing links to OhHell 1.0.4 as a courtesy, and makes no representations regarding OhHell or any other applications or any information related thereto. Any questions, complaints or claims regarding this application OhHell 1.0.4 must be directed to the appropriate software vendor. You may click the publisher link of OhHell on the top of this page to get more details about the vendor.